The first flag book to show from our eighth book swap, is one that I made for the swap, MyHandboundBooks! I took the theme literally, to the extreme, as you can see. I used the Canadian flag to create my pages and cut them so that the maple leaf pops through the middle of each frame. The paper on the covers is an Italian vein hand-marbled paper that I made. 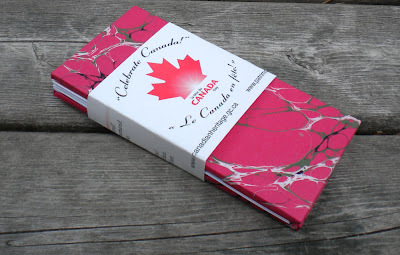 I used a Canada Day bookmark to create a wrapper that fits around the book to keep it closed. Check out MyHandboundBooks.Etsy.com to see more of my work. Nice work! Yay for Canada!